This week, the 15 Minute Supper bloggers were challenged to come up with a quick appetizer that could be made in 15 minutes or less….and I was almost stumped. Honestly, I was just busy. And feeling uninspired. At the last minute, I decided to consult my family recipe book, compiled by one of my Aunts years ago, to see if anyone in my extended family happened to have an easy appetizer that I could make and share. 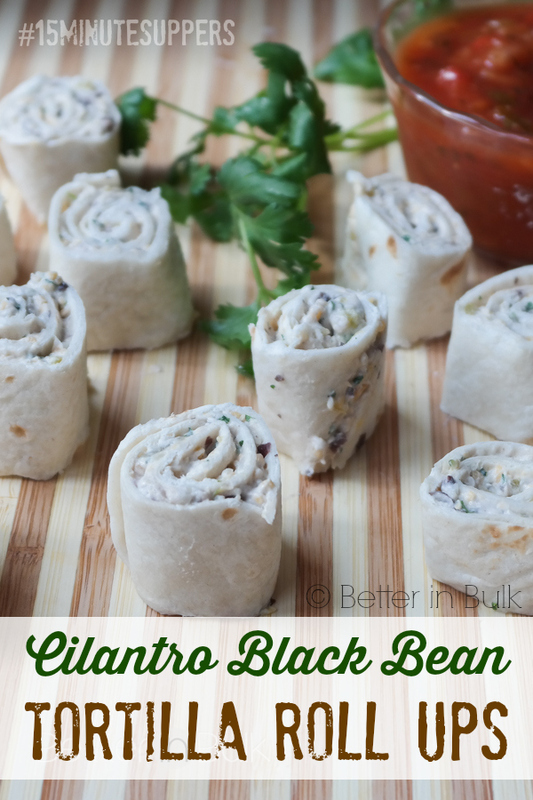 My Aunt Connie pulled through for me, and although I changed around more than a few of the ingredients on her recipe, I owe the inspiration for these cilantro black bean tortilla roll ups to her. 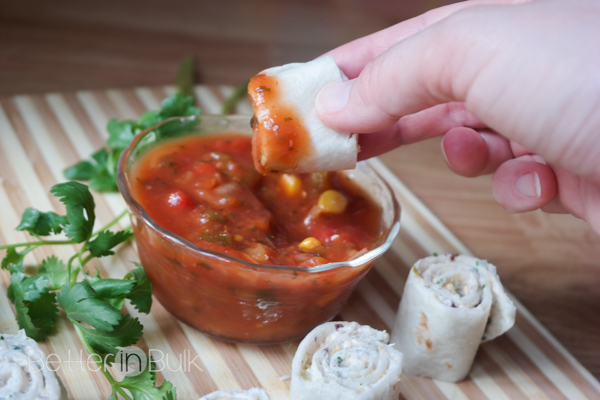 These tortilla roll ups couldn’t be much easier. I just threw everything into my blender (cheese included) to make the cheesy black bean spread. No chopping of ingredients needed! Place all ingredients in a blender and pulse until the cilantro and black beans are finely chopped. Spread cheese mixture on tortillas. 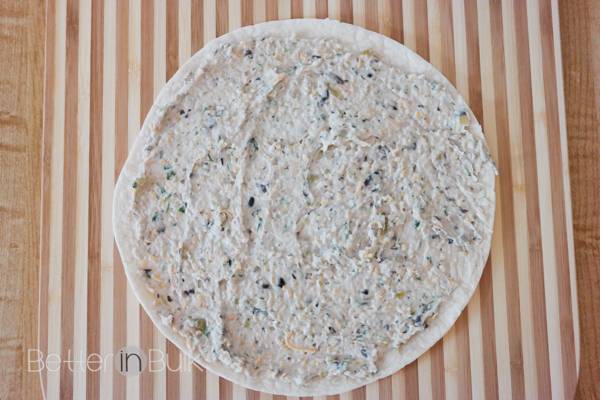 Roll up and then slice into1½ inch pieces. Serve with salsa. Note: If you have extra time, you can wrap each rolled tortilla in foil and refrigerate until ready to serve. Slice right before serving. 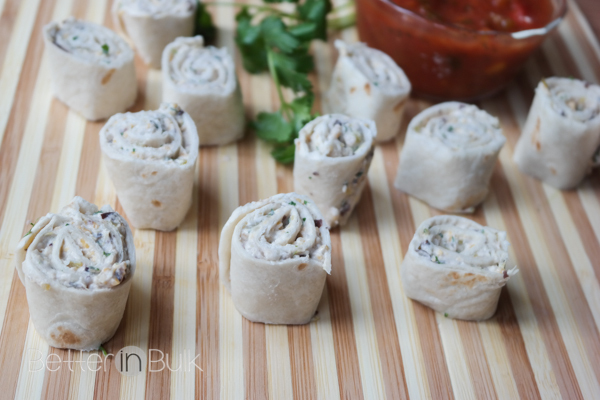 I love that these tortilla roll ups are an easy and quick savory alternative to bring to a party. Because they’re full of beans and cheese, they’ll be nicely filling, too. I can’t wait for my next get-together now! …to this in just a few minutes! Those look really tasty! I’d love for you to share over at a new party called Let’s Party https://themarkandjanshow.com/2018/01/02/lets-party-2/… look forward to seeing you there! Thanks for partying with us at Idea Box! See ya back next week! These look amazing! Thanks for sharing!! I love black beans and cilantro! I might have to make these for an appetizer next taco Tuesday!! Love the flavor combination, I could eat all of them! :-) Saying hello from totally talented Tuesdays! My husband would go crazy for these, I am definitely making them. I’m always looking for new uses for beans in cooking because they are so economical, healthy and fiber filling! This was genius and I will use this for Mexican night! Thanks so much for the recipe! I love the presentation for this appetizer and I have lots of fresh cilantro growing in my garden. 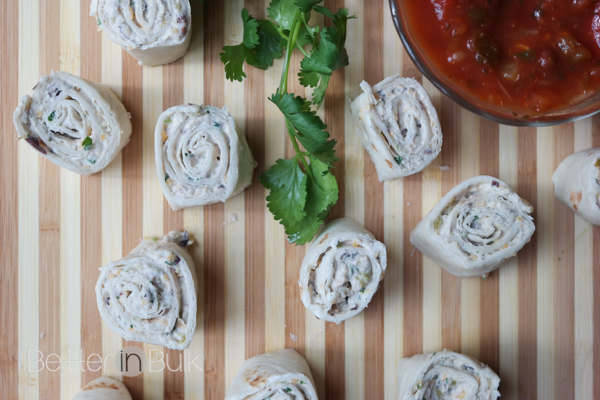 These roll-ups with definitely be on the menu at out next BBQ! I love Black Beans and I love Cilantro, but I’ve never had them together. These Tortilla Roll-Ups look delicious. I’m looking forward to trying these. Thanks for sharing the recipe. This seem very quick and easy. I’d add extra cliantro, but I’m addicted to it. My 21 year old loves black bean tortillas, I will have to try this variation next time she comes over! These look yummy. My son loves tortilla roll ups. I have made a variation of these before for potlucks and I know from experience that they go FAST! I will have to try them with the black beans- it sounds even better!